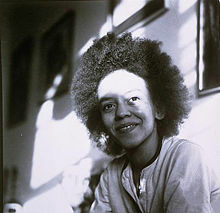 From the famous opening line “I was born in the congo” to powerful boasts such as “I am so hip even my errors are correct,” Nikki Giovanni’s poem “Ego Tripping” contains a certain rebellious spirit that has made it one of the most memorable poems in African American history. The speaker of the poem is a confident black woman capable of sending “an ice age to europe,” creating the Nile River, and turning herself into Jesus. That Giovanni published a printed version of the poem early on in a book for children and on an audio recorded version of the poem on a gospel album speaks to what makes the piece appear as militant, at least in those contexts. Rarely has a leading poet presented a piece for children, for instance, that presents a black woman as so supernatural and connected to world events and history. Toasts or African American poetic narratives where a figure boasts and exaggerates his or her attributes are usually produced by black men. Rap music is filled with toasts. Long before rap music however, African American men composed and performed extensive, humorous and sometimes profane narratives about their supposed special importance. Giovanni takes on the typical verbal practice of men and remakes it for black women. You can imagine how empowering the poem would have been for the young sisters. The power and confidence of the poem is what has made “Ego Tripping” so popular among so many black women over the years.